Updated An America retinal neuroscientist has focused his boffinistic eye on the iPhone 4's much-touted high-res display, and has come to the conclusion that Apple's claim that the "Retina display's pixel density is so high, your eye is unable to distinguish individual pixels" is true. "I'd find Apple’s claims stand up to what the human eye can perceive," writes Bryan Jones after an exhaustive analysis of the iPhone 4's 3.5-inch, 960x640 display. Jones' conclusion contradicts an earlier assertion by DisplayMate Technologies CEO Raymond Soneira, who dismissed Steve Jobs' claims as "marketing puffery". When introducing the iPhone 4, the Apple CEO said: "It turns out there’s a magic number right around 300 pixels per inch, that when you hold something around to 10 to 12 inches away from your eyes, is the limit of the human retina to differentiate the pixels." Jones notes that the iPhone 4's sub-pixels may themselves have sub-pixels — but he's "not sure about this"
Soneira said, in effect, "hogwash." Then, after Discover published a rebuttal to his argument, he issued a rebuttal to the rebuttal. "Examining this issue more closely, the iPhone 4 is actually very far from a retina display — it's a substantial discrepancy and not even close: At 12 inches the 1 dimensional linear ppi shortcoming is 326/477 = 68 percent. But the pixel (area) density for 2 dimensions, which is the actual relevant observable, is that value squared = 0.47, so the iPhone 4 is more than a factor of 2 from being a retina display at the typical 12 inch viewing distance." Got that? Well, to be frank, it took your humble reporter a few readings to get aboard Soneira's rebuttal2, and he's still having a wee bit of difficulty riding Soneira's train of thought to its terminus. But Jones, the retinal neuroscientist, understood immediately — one assumes — and rebuffed the arguments of Soneira, the display technologist. "While Dr. Soneira was partially correct with respect to the retina," Jones writes, "Apple's Retina Display adequately represents the resolution at which images fall upon our retina." Dr. Soneira's claims are based upon a retinal calculation of .5 arcminutes which to my reading of the literature is too low. According to a relatively recent, but authoritative study of photoreceptor density in the human retina (Curcio, C.A., K.R. Sloan, R.E. Kalina and A.E. Hendrickson 1990 Human photoreceptor topography. J. Comp. Neurol. 292:497-523. ), peak cone density in the human averages 199,000 cones/mm2 with a range of 100,000 to 324,000. Dr. Curcio et. al. calculated 77 cycles/degree or .78 arcminutes/cycle of *retinal* resolution. However, this does not take into account the optics of the system which degrade image quality somewhat giving a commonly accepted resolution of 1 arcminute/cycle. So, if a normal human eye can discriminate two points separated by 1 arcminute/cycle at a distance of a foot, we should be able to discriminate two points 89 micrometers apart which would work out to about 287 pixels per inch. Since the iPhone 4G display is comfortably higher than that measure at 326 pixels per inch, I’d find Apple’s claims stand up to what the human eye can perceive. 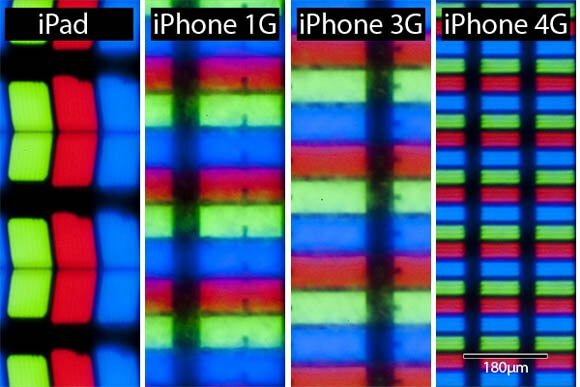 In other words, while your retina may have a higher resolution than that of the iPhone 4's Retina display, there's more to your optical system than just a retina. You need to keep your entire ocular kit and caboodle in mind. And when you do, says Jones, you must admit that Steve Jobs was accurate when he claimed that your eye can't see individual pixels when you hold your iPhone a foot from your face. My analysis and comments on the Retina Display were widely distorted and transformed into an attack on Apple and Steve Jobs — they were not. I simply did a quantitative analysis of what was said in the context of my campaign to eliminate (or more realistically reduce) exaggeration in display specs. Apple's claim falls under glorious wording rather than numerical spec abuse — and even with quantitative analysis it's minor compared to what other manufacturers are saying. I sent Steve Jobs an Email explaining that and got a reply from him. In his email to the The Reg, Soneira reiterates that his disagreement is with Apple's use of the term "Retina Display" and Steve Jobs' statement that the iPhone 4's display has a resolution that exceeds "the limit of the human retina to differentiate the pixels." I used the accepted value for the visual acuity of the Retina (see below) and found that the iPhone was more than a factor of 2 short on pixels to be a Retina Display. The iPhone 4 would need to have 1.3 megapixels instead of 0.6 megapixels to be a true Retina Display at 12 inches. At 10 inches it would need even more — 1.9 megapixels — a factor of 3 short. Soneira sums up his argument by saying: "The iPhone 4 is a fabulous display, it's just not a Retina Display — but it's good enough for 20/20 vision when held at 12 inches or more from the eye." And in conclusion: "Since Apple makes great products that have excellent specs it will be a lot better for them if everyone sticks with the true objective values instead of values exaggerated by marketing departments."